Released in December 1982, E.T. The Extra-Terrestrial is the original terrible movie tie-in game. Being at best marginally related to the plot of the movie, having poorly designed and repetitive gameplay and leading to plentiful disappointed children cursing their parents the week after Christmas this game perfected the licensed cash-in years before it became mainstream in the industry. Best time: 0:00:53 by 'DSmon' on 2013-07-19. 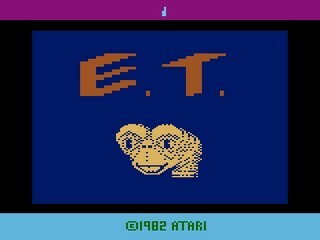 Despite being considered as one of the worst games of all time and being linked to the Video Game Crash of '83, "E.T. The Extra-Terrestrial" is in fact my favorite game on the 2600. The biggest thing of note for me is that this run is faster than the TAS for this game which I'm very proud of. - I use a Sega Genesis/MegaDrive controller instead of the regular Atari joystick because those are unbelievable bad. - The way that the phone pieces work is that they are set based on the frame when the fire button is pushed on the title screen. It just so happens that the best pattern is the very first frame, so all you do is hold the fire button down while starting the system for the optimal pattern. - After picking up a phone piece in a pit, sometimes the game won't recognize my input to hover. That didn't happen in this run which is a good thing. - My route differs from the TAS's with the use of the Teleport spots to quickly traverse the screens to save an estimated ~1.3 sec.